Hope you all had a great weekend with lots of sunshine! These past few days have been really gloomy for SoCal, but as long as there’re some rain, I really don’t mind at all. We need as much rain as we can get. Today’s post features one of my post-holiday great finds, which is this coat from Piperlime. I got a great deal when they had 60% of their final sales. The quality is acceptable for the price. 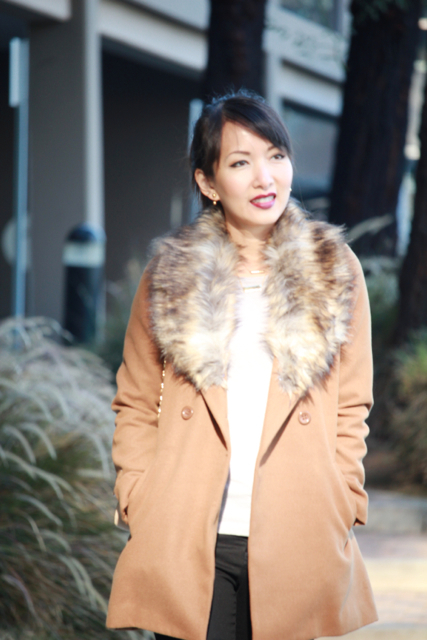 There are two things I love about this coat; the neutral color and most important, its fur collar is removable. I’m always a sucker for a versatile piece, where there’s little bit of modification, the piece turns out a different style.